This chart covers the week commencing February 4th to February 10th. For the first time in this chart's history, Fortnite has been knocked from the top spot. Epic's battle royale phenomenon has lost its crown to Apex Legends, a new, free-to-play battle royale offering from Titanfall developers Respawn Entertainment. The game has racked up over 39.6 million hours watched in its first week. However, its numbers are boosted significantly by the interest of some of Twitch's biggest creators, including Ninja and Shroud. Should these streamers return to their flagship titles, numbers for Apex Legends could fall as fast as they rose. 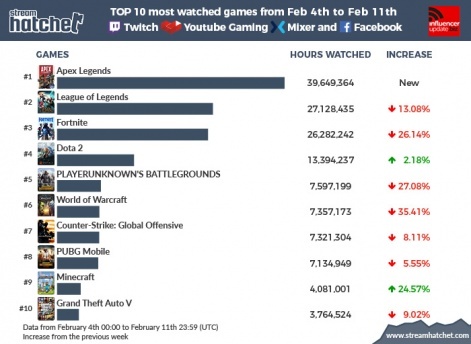 Despite the battle royale carnage, League of Legends remains in second place, despite a 13 per cent decrease in views. Fortnite takes the bronze last this week, sitting in third place after a 26.1 per cent decrease in hours watched. 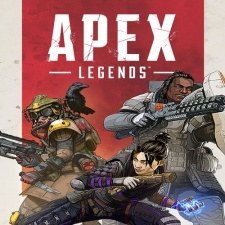 It racked up 26.2 million hours, over 13 million less than Apex Legends. Dota 2 is in fourth last week, knocked off the top 3 by Fortnite. Despite the dip, views for Steam's MOBA were up by 2.1 per cent. PUBG manages to stay in fifth for another week despite a 27 per cent drop in views last week. Just like Fortnite, some of the biggest PUBG creators have hopped over to Apex to see what the fuss is about. World of Warcraft takes sixth place, down from fourth after a 35.4 per cent decrease in views. CS:GO is in seventh for a second week running; an 8.1 decrease in views last week has not affected its place in the top 10. PUBG mobile is still going strong in eighth, and is hot on the heels of CS:GO despite a 5.5 per cent decrease in hours watched in the last week. Number nine sees the return of Minecraft, which had a 24.5 per cent surge in hours watched this week. Mojang's crafting sensation popped back into the charts last month. Another old title makes a return in tenth too - Grand Theft Auto 5 racked up 3.7 million hours watched last week which puts it back into the top 10.